The cause of Parkinson is unknown. Medical experts believe the symptoms are related to a chemical imbalance in the brain caused by brain-cell death. Parkinson is chronic, and symptoms grow worse over time. Although the disease may appear in younger people (even teenagers), it usually affects people in late middle age. It is not contagious. Environmental causes are being researched. Findings have shown that rural living, exposure to well water, and exposure to agricultural pesticides and herbicides are related to Parkinson. It is important to remember, however, that these factors do not guarantee the development of the disease, nor does their absence prevent it. Currently researchers believe that in most people, the cause of Parkinson’s is a mix of genetics and environmental exposure. Parkinson may accompany other neurological conditions such as Shy-Drager syndrome, progressive supranuclear palsy, Wilson disease, Huntington's disease, Hallervorden-Spatz syndrome, Alzheimer's disease, Creutzfeldt-Jakob disease, olivopontocerebellar atrophy, post-traumatic encephalopathy, and dementia with Lewy bodies. The biggest risk factor for Parkinson is advancing age. The average age for the onset of Parkinson is 60 years. In addition, men are affected more than women. However, the reason for this is unclear. Family history is another important risk factor. A person with an affected parent or sibling, when compared to the general population, has a 4% to 9% increased chance of developing Parkinson. This increased risk is most likely because of a combination of environmental and genetic factors. Having 1 or more close relatives with Parkinson increases the risk of developing the disease. But, unless there is a known genetic mutation for Parkinson present, the increased risk is 2% to 5%. Postural instability. Poor posture and balance that may cause falls; gait, or balance problems. Symptoms of Parkinson vary from person to person. The symptoms may appear slowly and in no particular order. Early symptoms may be subtle and may progress over many years before reaching a point where they interfere with normal daily activities. As the disease progresses, walking may become affected, causing the person to stop in mid-stride or "freeze" in place, and maybe even fall over. People also may start walking with a series of quick, small steps as if hurrying forward to keep balance, a practice known as festination. The symptoms of Parkinson may look like other conditions or medical problems. Always see your healthcare provider for a diagnosis. Diagnosing Parkinson in the early stages can be difficult. At first, signs and symptoms may look like other conditions or the effects of normal aging. For this reason, your doctor may want to monitor your symptoms for some time until they are consistently present. Currently, there are no blood or lab tests to diagnose Parkinson. Diagnosis of Parkinson is based mainly on a medical history and thorough neurological exam. Brain scans or lab tests may be done to help rule out other diseases or conditions, but brain scans generally will turn out to be normal with Parkinson. Trial test of drugs. When symptoms are significant, a trial test of drugs (primarily levodopa [L-dopa]) may be used. If symptoms are relieved from the use of levodopa, this suggests Parkinson. 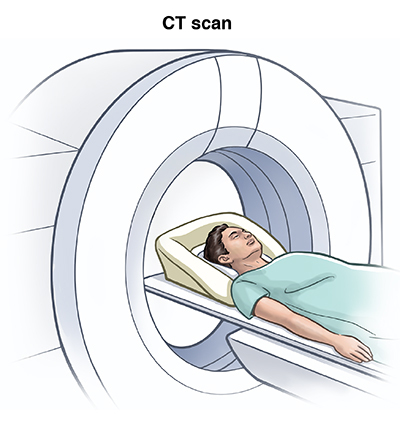 Computed tomography scan (also called a CT or CAT scan). An imaging procedure that uses X-rays and a computer to make horizontal, or axial, images (often called slices) of the body. A CT scan shows detailed images of any part of the body, including the bones, muscles, fat, and organs. CT scans are more detailed than general X-rays. Magnetic resonance imaging (MRI). A procedure that uses large magnets, radiofrequencies, and a computer to make detailed images of organs and structures within the body. No 2 people react the same way to a given drug. It takes time and patience to find the right medicine and dosage to relieve symptoms. In some cases, your doctor may recommend surgery for Parkinson disease. Several types of surgery may be done that can help people with Parkinson disease. Most of the treatments are aimed at helping the tremor or rigidity that comes with the disease. In some people, surgery may decrease the amount of medicine needed to control the symptoms of Parkinson. Deep brain stimulation (DBS). With this type of surgery, a small electrode is placed in the deep parts of the brain that help control movement. The electrode is attached to a small battery in the chest wall and is connected by wires that are placed under the skin. The stimulator is then turned on and interrupts the normal flow of information in the brain and can help to decrease symptoms of Parkinson's. It is important to remember that surgery may help with symptoms of Parkinson, but does not cure the disease or stop its progression. Although Parkinson is a chronic, progressive disease, treatment can help relieve symptoms. It is also important to eat a healthy diet and maintain mobility with the use of assistive devices, if needed. Regular exercise, physical therapy, occupational therapy, and speech therapy can promote independence. Talk with your healthcare provider about depression, anxiety, or other mental health issues that may arise. Parkinson is a slowly progressive, degenerative motor system disorder. The most common symptoms are muscle rigidity, resting tremor, slowness in initiating movement, and postural instability. There is no known cure for Parkinson’s but medications and surgery can help control symptoms. Proper diet, regular exercise, physical therapy, occupational therapy, and speech therapy can promote independence.